​Episode #215: Hello from the Canadian Stuttering Association 2017 conference! On this episode, I talk to conference speakers and organizers to find out how improv can help people who stutter, how to tell a joke despite your stuttering, and what it is like to organize a stuttering conference. Then I talk a bit about my experiences with Inktober and my future plans for Stuttering is Cool. This episode brought to you by my book, Stuttering is Cool: A Guide to Stuttering in a Fast-Talking World. 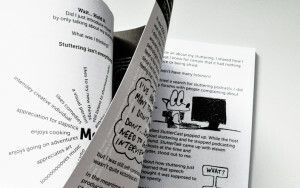 Packed with tips, stories, encouragement and comics for stuttering resilience and joy. Next Post The tenth anniversary episode!